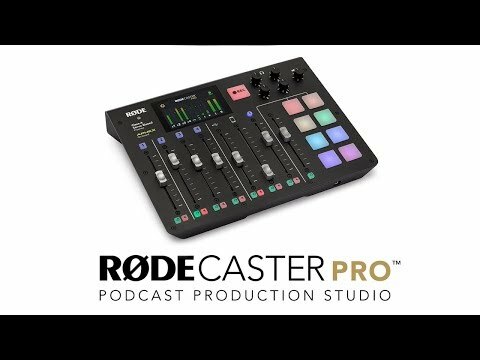 Choosing the right Podcast equipment can be complicated - simplify it all with the new Rode Rodecaster Pro. An all-in-one Podcasting Mi.. Choosing the right Podcast equipment can be complicated - simplify it all with the new Rode Rodecaster Pro. An all-in-one Podcasting Mixer, Interface and FX Unit with everything you need to run a Podcast Studio in one place! Designed for seamless connectivity, control and integration with microphone, telephone and computer inputs, the Rodecaster Pro can have you up and running within minutes of getting out the box. Record directly to SD Card or to your DAW Software via USB. Simplify your control over input and output levels, jingles and more with on-board faders, knobs and full-colour touchscreen. Rodecaster Pro is perfect if you're just starting a Podcast project, or a seasoned professional user who wants simplicity and convenience in one broadcast-friendly unit. Rodecaster Pro is equipped with 4 high-powered headphone outputs using discrete circuitry for clarity and presence, each with its own volume level. A switchable headphone limiter ensures no deafening spikes. Left and right TRS speaker outputs provide quality playback listening, or can feed a PA for an audience if podcasting live. The Rodecaster Pro allows you to instantly record your master mix output to DAW Software via USB. Alternatively, utilise the on-board MicroSD card slot and take your final project anywhere to polish your final mix. The RodeCaster Pro comes with 8 programmable sound effects pads, for instant triggering of sound effects, music, jingles, applause and ads. They're perfect for turning a boring podcast into a dynamic, entertaining show without spending hours on advanced editing techniques or post-processing. You can record audio direct to the programmable pads from any input, or simply “drag and drop” files from your computer using the supplied software. Simple, easy to use, and easily fine-tuned if you have more than one show to host. Have a remote guest you want to interview? Simply connect your phone to the RODECaster Pro via Bluetooth or with a TRRS cable. The RODECaster Pro automatically provides “mix-minus” audio to prevent echo being heard by the caller, without the need to purchase dedicated and costly hardware. Telephone interviews via Mobile or Skype with a remote guest never sounded so good! The RØDECaster Pro’s pristine preamps and outputs feature Class A circuitry, as featured on broadcast consoles that cost hundreds of thousands of dollars. The Class A preamps provide a much cleaner gain structure with lower levels of distortion, providing an incredibly clean, low-noise signal. The Preamps are also servo-biased, keeping distortion levels low. Your signal is broadcast-pure. Rodecaster Pro features APHEX Aural Exciter and APHEX Big Bottom signal processing under the hood. Combine these integrated processing tools with a quality condenser mic and you'll have the recipe for pro-grade sound for your Podcast. Compression and noise-gate - Adds depth, tone and consistency. High-pass filter - Eliminates low-end rumble. De-esser - Lessen sibilance on “s” words. Auto setup - Quickly sets the level of you and your guests.